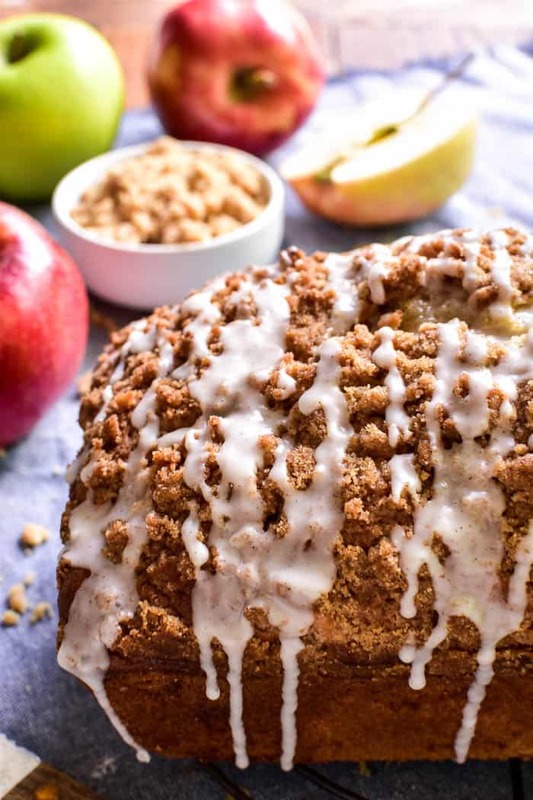 Welcome in fall with this easy Apple Pie Bread! 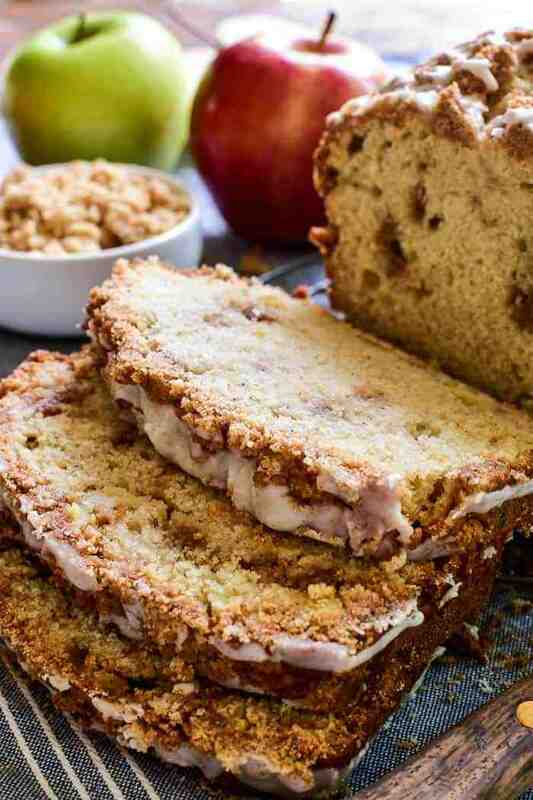 This quick bread combines fresh chopped apples with brown sugar cinnamon streusel and a sweet cinnamon glaze. It comes together in no time and bakes up into a delicious treat no one can resist. Perfect for breakfast, snack, or even dessert….if you love apple pie, you’ll fall in love with this Apple Pie Bread! Apple Pie. It’s basically the quintessential fall dessert! It’s the perfect way to take advantage of fresh fall apples and seriously the best way to make your house smell amazing. And…there are SO many ways to do it! Why stop at just pie when you can have Apple Pie Bars and Apple Pie Sangria and Apple Pie Crescent Rolls? And if you can find a way to have it for breakfast? Even better. Apple Pie Bread is quite possibly our favorite bread ever. Not just because it means you can have apple pie for breakfast…(although that’s a definite bonus)….but because it’s literally oozing with deliciousness. 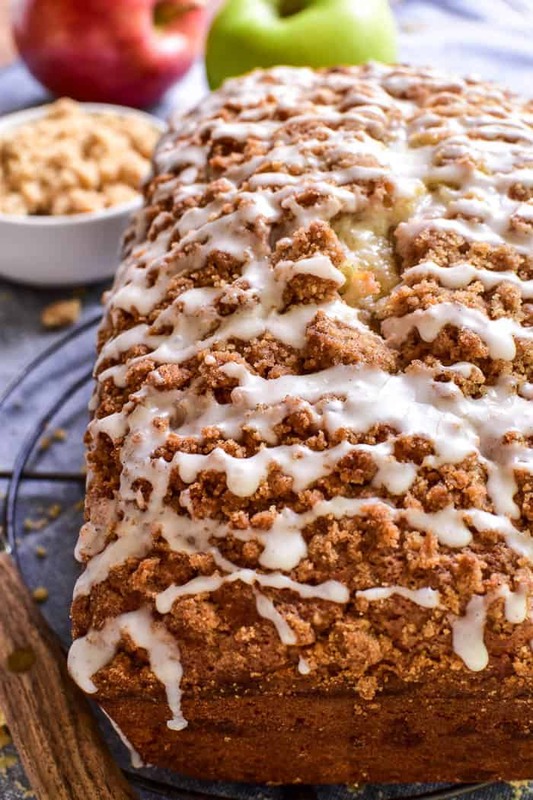 Between the fresh chopped apples and the brown sugar cinnamon streusel and the sweet cinnamon glaze, this bread really does have it all. And best of all, it’s quick and easy to make. It’s an ideal grab & go option for busy mornings, and perfect for enjoying with a cup of coffee on a lazy weekend day. And….it would make an amazing addition to any holiday meal or dessert table! I was inspired to make this Apple Pie Bread by one of my latest trips to Pick ‘n Save. There was just something about all the different varieties of apples – the colors, the sizes, the flavors – that I couldn’t resist. I always love the fresh produce at Pick ‘n Save, and I love the fact that I know I’ll find everything I need. 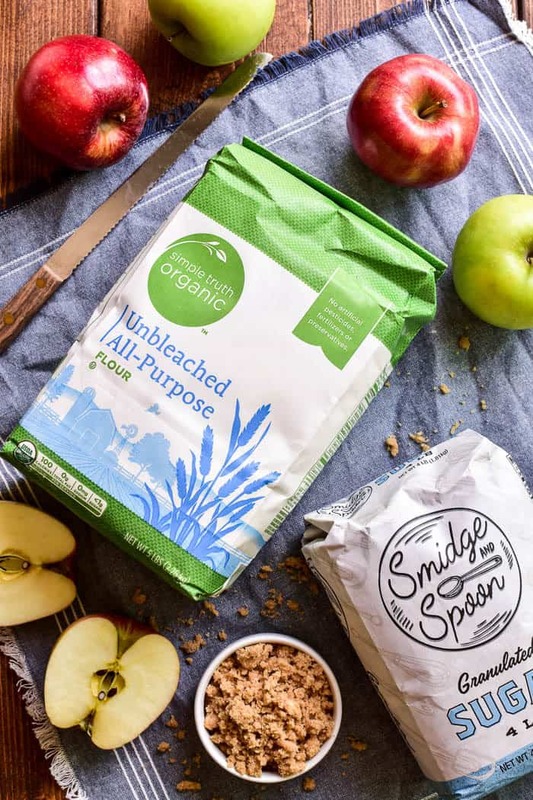 For this Apple Pie Bread I selected Gala and Granny Smith apples, along with their new Smidge & Spoon Sugar and some of my favorite Simple Truth Organic ingredients. And the end result was nothing short of amazing….if I do say so myself. HOW DO YOU MAKE APPLE PIE BREAD? In a large mixing bowl combine 3 c. flour, 1 c. sugar, 1 Tbsp. baking powder, 1/2 tsp. salt, and 1/4 tsp. baking soda. Set aside. In a medium mixing old combine 1 large egg, 1 2/3 c. milk, and 1/4 c. oil. Add egg mixture all at once to dry mixture. Stir just until moistened. Add 1 c. chopped, peeled apples (I used Gala and Granny Smith) and 1/2 tsp. cinnamon. Spoon 1/2 of batter into a greased 9×5 inch loaf pan. In a small bowl combine 6 Tbsp. flour, 6 Tbsp. sugar, 4 Tbsp. softened butter, and 1/8 tsp. cinnamon. Use a fork to blend until mixture resembles large crumbs. Sprinkle half of streusel over the first 1/2 of batter; add remaining batter and sprinkle remaining streusel over the top. Bake at 350° for 60-75 minutes, until bread is golden brown and toothpick inserted in center comes out clean. Cool in pan on a wire rack; remove loaf from pan and cool completely. In a small bowl combine 1/2 c. powdered sugar, 2 1/2 tsp. milk, and 1/8 tsp. cinnamon until smooth. Spoon over cooled bread. WHAT KIND OF APPLES ARE BEST FOR APPLE PIE BREAD? 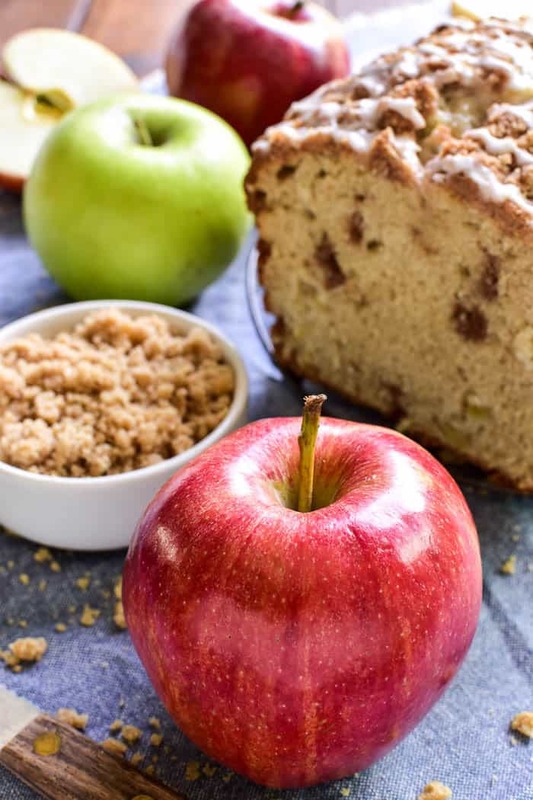 I used a combination of Gala and Granny Smith apples in this Apple Pie Bread, but you can use any of your favorites. In general, I like to combine a sweet variety with a tart variety for a more well-rounded flavor. HOW DO YOU STORE APPLE PIE BREAD? This Apple Pie Bread should be stored at room temperature. I typically wrap mine in foil or store it on a covered plate, but you can also store it in a large ziploc bag or other airtight container. 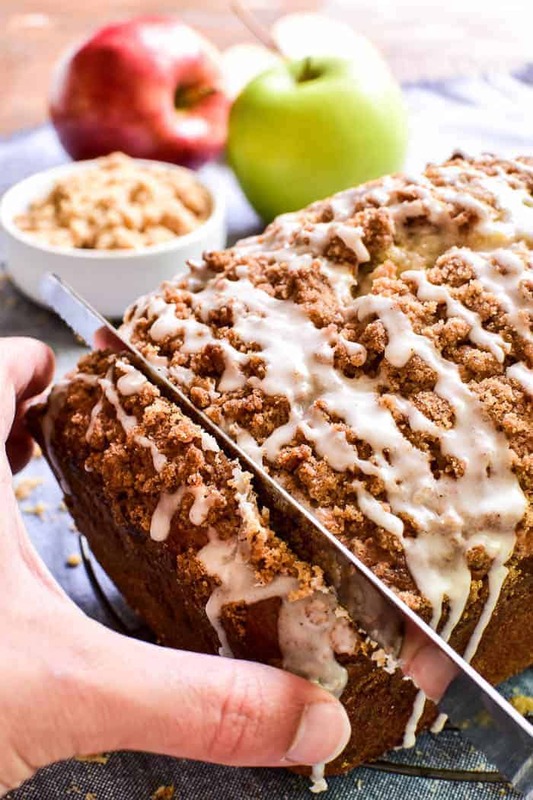 Welcome in fall with this easy Apple Pie Bread!This quick bread combines fresh chopped apples with brown sugar cinnamon streusel and a sweet cinnamon glaze. It comes together in no time and bakes up into a delicious treat no one can resist. Perfect for breakfast, snack, or even dessert....if you love apple pie, you'll fall in love with this Apple Pie Bread! In a large mixing bowl combine flour, sugar, baking powder, salt, and baking soda. Set aside. In a medium mixing old combine egg, milk, and oil. Add egg mixture all at once to dry mixture. Stir just until moistened. Add chopped apples and 1/2 tsp. cinnamon. In a small bowl combine streusel ingredients; use a fork to blend until mixture resembles large crumbs. Combine glaze ingredients and spoon over cooled bread. OMG! This is going to be my favourite bread now! Trying your recipe super soon. Is it white sugar in the bread and brown sugar in the streusel? Recipe doesn’t specify. Can’t wait to try this. Thank you! I want the entire loaf right this minute!! Look at that topping! Look at that glaze!! ohhhh boy! Wow looks perfect and tasty! Can’t wait to have this anytime of the day, love it! OMG! I love the texture of this Apple Pie Bread! A must try recipe! It looks so good! Perfect with my morning coffee! I think I will make apple pie muffins. I love to freeze them, so I have them whenever I want! I like this bread! That sounds so flavorful! One of my favs. I can’t WAIT to try this! Thank you for this great recipe! So YUMMY! I like this bread! Wonderful combination of ingredients. It look so yummy! Do I need 1 cup of each apple or 1 cup combined? Hello, i can’t wait to try your Apple pie bread. Thank you for sharing your recipe. It calls for granulated sugar in the bread ingredients and then sugar in the streusel ingredients. Upon reading the entire post it says brown sugar streusel topping. I definitely need to give this a try! Perfect for fall!